Take advantage of this industrial hot melt special offer! 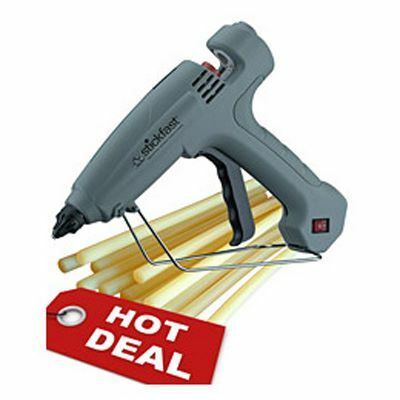 Buy 10 boxes of hot melt adhesive and get an HMGG03 glue gun worth £69.50 free! 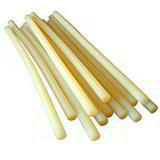 Choose from 3 types of 12mm x 300mm hot melt adhesive - 170 sticks per pack. 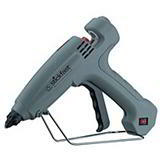 HGG03 medium duty glue gun - this easy to use, high precision 240v glue gun is designed for regular multi purpose use in industrial settings, and features variable temperature and adjustable glue shot controls. Simply plug in, load a 12mm hot melt glue stick and you're ready to seal cartons and secure inserts without the need for tape, staples or strapping. Fast Setting Adhesive - superior hotmelt adhesive for precision fixing sets in around half the time of standard hotmelt glue, so you can increase productivity and output. ideal for fast carton sealing, general packaging use, product assembly, securing fabrics, upholstery and a multitude of other applications. Multi-Purpose Adhesive - as well as carton sealing and general packaging also sticks plastic, polystyrene and textiles, so is a good all-round choice. This hot melt adhesive takes around 20 to 30 seconds to set and provide a strong bond. High Strength Adhesive - a versatile packaging and industrial glue. This strong hotmelt glue will stick to cardboard, plastic, polystyrene, textiles, ceramics and metals and is a good choice for all-round industrial use. The adhesive takes around 20 to 30 seconds to set and provides a high strength bond. 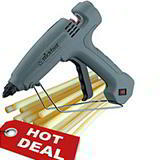 Take advantage of this great hot melt glue gun and adhesive offer!